Astrology can aid any analysis of personality. It can be simple, or it can also capture the subtle variations that come with the placement and aspects of planets in one’s chart. Those complex layers were examined in the previous Snapshot of Robin Williams, as well as in others in this collection. 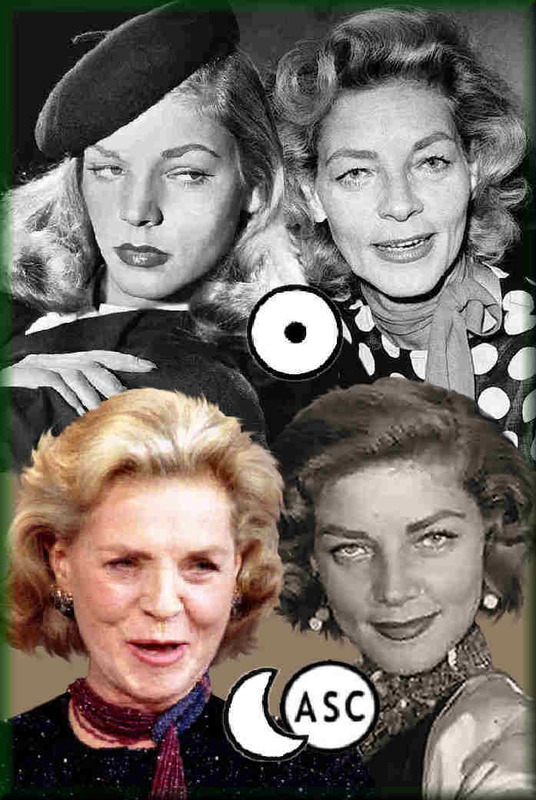 However, in this interpretation of Lauren Bacall, the nature of her nature is clearly defined, without complicating factors. In her first film To Have and Have Not (1944), we saw a young Lauren Bacall casting a sultry coolness, not seen on the silver screen since Greta Garbo (another Virgo Sun). With her earthy nature, Lauren charmed Bogey’s detective mind, enticing him with her offer of service: “If you want anything, just whistle”. In this film and all that followed, Bacall seems to always be impeccably dressed, proper and practical, with not a hair out of place—even though (like most mutable signs) the mane curls off in different angles on the sides. Physically, Lauren shows the distinct facial division, often seen in a Virgo personality. Note how one side of the face skews upward from the other. This sets one eye noticeably higher as it tilts the nose and mouth in opposite directions. It’s difficult to define the physical shape of mutable signs since they change so much, but with Virgo, the twists and bends are held in place by Earth and this makes this the easiest mutable sign to detect. With the passage of years, Lauren Bacall’s image turned into that of a stringent but also resourceful and independent woman of the world. This is reflected in the other components in her chart. When Lauren Bacall ceases to project the light of her luminaries, she holds up her radiant Leo shield. This fixed mask hid the mutable qualities seen in her Virgo personality, as it stilled her aggressive Aries Moon. It also made her appear warmer and more confident. Like most Leo Rising Signs, Bacall feels at home putting herself out there “on show”. Before becoming a film star, she began her drama career on stage. When her film career waned, Lauren made her triumphant return to Broadway performing in Applause—winning the hearts of her audience once again. (She has Venus on the Ascendant and this makes her all the more attractive to others). Physically, we see the lion features in Bacall’s bone structure—in the block-like forehead and in the wide cheek bones. This proud persona was readily seen, whether she was entering a room, or proudly strutting up to center stage. With her Leo Ascendant, Bacall presented her staid and warm persona. However, as as demonstrated in her rare interviews, then Lauren got emotional, it was like someone threw gas on the fire! Instantly, the flames would ignite in an intense and highly directed explosion. Fortunately, like most Aries Moons, this immediately disarms the emotional concerns and everything quickly returns to normal. In this analysis of personality, we must include Bacall’s Aries Moon. For it is in her emotional reactions that she release herself from the detailed urges of her Sun and expressed her true feelings. There was no beating around the bush; Everything was simply right on point. Positively, this enhanced her sense of independence as it reduced the worrying factor in her Virgo personality. If you know an Aries Moon, you might notice the words “I”, “me” and “mine” frequently appear in their emotional outbursts. Fortunately, as was noted before, these “selfish” moments end as quickly as they start. This tendency is not as prominent in an Aries Sun.